With the launch of the 128K Spectrum, several software houses have updated popular titles in order to take advantage of its extra memory. Sweevo’s Whirled, a single load version of The Never Ending Story and a sonically improved Robin of the Wood were all mentioned in last month’s CRASH but strategy games manufacturers haven’t made any moves as yet. With the absence of a standard fast storage device, the RAM disk facility provided by Sinclair’s latest prodigy is just crying out to be taken advantage of by a good, solid wargame. A couple of issues ago, I mentioned that the author RT Smith was disappointed at having to gloss over some details in Desert Rats and last month’s FRONTLINE FORUM contained a letter from the author of Waterloo about omissions in his game. Both lay the blame on the lack of memory. Now their games can be freed of these constraints. Of course, the vast majority of Sinclair users will have standard Spectrums and to ignore these people would be foolish. But a good strategy game could be devised for the 128 that could could come in multiple load format for the 48K machine. That would be something to look forward to. Having hoped about the future, I’ll now pine about the past. Good strategy games have been around on the Spectrum for longer than many people realise. Yes, longer even than Arnhem. CCS and Lothlorien are responsible for many of the pioneering titles, being the best established purveyors of such material, but others have made their mark. How many people remember the ill-fated Red Shift, for instance? Nobody? Never mind, it’ll all come back to you when you start reading the next bit. The time has come to look back at some oldies, you see. There are two reasons for this. One is that it’s All Quiet on the Strategy Front this month. The second is in no way connected with the fact that the spiky Mr Kidd threatened to impale me on his haircut unless I did something a little different — and he wasn’t too pleased about my suggestions for outlining Sean Masterson’s Strip Diplomacy in these hallowed pages. This game marked a change in direction for Lothlorien. It was the first title to take advantage of Lothlorien’s skills as a design and programming house in combination with Argus Press Software’s marketing power. The game was glossily produced in medium format complete with historical dossier covering events and decisions leading up to the conflict, notes on playing techniques and of course, instructions for play. The game has single and two player options. One of the fascinating details about the conflict was the fact that the Allies made the same crucial mistake twice. In 1940 the French commanders wrongly concluded that tanks could not be effectively deployed in the dense forest of the Ardennes — a mistake which contributed to the rapid fall of France. By Christmas 1944, the Allies had pushed the Germans back to their borders, Then made the same mistake as the French: only a light screening force was deployed on the Ardennes front, Hitler knew that enough pressure could be brought to bear, creating a bulge in the enemy front and leaving him in an ideal position to take the Allied supply base at Antwerp. The Battle of the Bulge, or Wacht am Rhein as the Germans called it, is an excellent choice for a military simulation and this one is the best cassette based simulation of the conflict available for any micro. The map is well defined and simultaneous movement adds to the professionalism of the program. Both sides have to learn different lessons from the fighting. The German problem is mainly one of logistics. They have to move fast to knock out enemy resistance before being bogged down. The Allied player, on the other hand must choose his methods of defence well. Initially, the Allied forces will be vastly outnumbered and outgunned. Only clever deployment of meagre resources coupled with the realistic view that some units will have to be lost to buy time can help win the day for the Allies. Whether or not a successful counter attack could have brought the Germans victory on the Western front is not in question here, though in case you’re interested, this seems most unlikely. Hitler had few resources, the Russians were looking unstoppable, the rest of the Axis powers were close to collapse and the Americans were only months away from having their first nuclear weapons (though the Germans too, were very close to achieving this aim). What is certain, is that a successful counter attack and consequent capture of Antwerp would have been a serious blow to the Allied war effort and would have lengthened the war by several months. Angus made this game a Smash and I wholeheartedly agree with him. There are no difficulty levels but the strength of the computer opponent is great and would take some time to master. 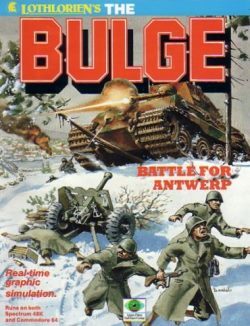 The Bulge would still be an excellent addition to any wargamer’s collection and a good game for the aspiring beginner also. The strategic map from STONKERS. The whopping great hatched oblong area isn’t an enemy weapon. Press a key and the area below it expands before your very eyes. Stonkers harkens back to the first Imagine incarnation and the daring days of software design. The game can be played either solitaire or with a second player. It’s an abstract strategy game where each side controls an army consisting of four infantry divisions, four armoured divisions, four artillery divisions and four civilian supply units. Each side also controls its own port (essential for a constant flow of supplies) and HQ. A total war zone map is displayed in bright colours on the screen. A cursor can be placed over any part of this screen and can then magnify the area below to show details of terrain and units. Terrain includes hills, marshes and plains. Units can then be ordered or resupplied as necessary. The objective is to simply defeat your opponent and capture territory. Forces are initially on opposite sides of the map on areas of land separated by a bridged river. The bridge is the only means by which an army may move from one side of the map to the other. The reason why the game is so good lies in the deceptive simplicity of its playability. Terrain does affect movement, but only trial and error reveal how much. Logistics are fundamentally important to a successful game. The player must learn to pace the game, so that whilst an efficient advance is made into enemy territory, units do not risk running out of supplies too soon. This makes the game a test of both will and judgement and an ideal vehicle for beginners to play in order to realise the importance of different unit types in more complex games. Yet playing Stonkers is an easily learned and enjoyable affair in its own right. 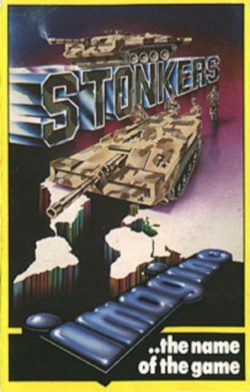 Stonkers is a remarkably straightforward game that never really had the credit it deserved. Reviewed back in CRASH No 2, the reviewers, none of whom were particularly enthusiastic wargamers, all found the game to be addictive and entertaining. One of the main problems encountered was a bug which crashed the game every so often. This bug was never really dealt with effectively but given time, it could have been rectified. The battleground for the Moonbase scenario in REBEL STAR RAIDERS. Lots of bits of technology to hide behind if nothing else. Now we’re going back in time a bit. Red Shift were known for their science fiction strategy series. One of the best of these was Rebel Star Raiders. As is typical of games of the time, the program takes ages to load. The player is presented with a choice of four scenarios on loading: Moonbase, Starlingale, The Final Assault and Expansion. These need to be loaded from tape individually and the scenarios themselves take as long to get into the computer as most modern games do. Ah, but these were the days when such things mattered not. The player is presented with a screen depicting a deck plan of an area of a ship or installation which has to be protected from attack by raiders. A few human operatives and a selection of droids is available to assist. Each deck is different, depending on the scenario, and some were designed to present a greater level of difficulty to the players than others. During play the defender deploys the crew one by one. Each crew member has a name and weapon, and weapons can include anything from pistols and sub-machine guns to lasers and grenades. Not unreasonably, each weapon has a different effect on the enemy — but these of course, are no more than variations on a theme. They are all deadly if used properly! Once Raiders have been deployed, the game begins. Movement and combat are handled by a points system which dictates how far a character may move and what courses of action are available to him. Damage is dealt with in a similar manner. The Raider’s forces outnumber the Defender’s but the Defender’s robots are armoured and consequently difficult to eliminate. The concept of the game is strikingly similar to that of a conventional board wargame called Azhanti High Lightning by Game Designers Workshop, which had deck plans for an 84 deck space cruiser and scenarios for shipboard combat. Both games are highly addictive, being well-devised tactical simulations with great variety in play. They provide a lasting challenge to the most persevering of tacticians. Red Shift no longer exists, which means it’s unlikely that you’ll catch one of their titles on your regular stockist’s shelves. Rebel Star Raiders was another title which suffered from a lack of adequate exposure when it was released. Anybody with a copy of the game should treasure it — the game has its faults, but it was (and still is) way ahead of its time. Next month, I’ll be taking a look at some old CCS games and one more Red Shift title, Nebula. I haven’t included ratings for these games, given the circumstances, but for those who are interested Stonkers scored an Overall rating of 78%, The Bulge was a Smash and Rebel Star Raiders was never reviewed. Until next month then.